All manner of variables are considered when a Thoroughbred horse breeder decides which stallion his mare will be bred to. Pedigree class, conformation of the stallion and his mare, temperament and racing success are key elements in the final decision. Subsequently when the resulting foal is born, the new individual is then assessed as he or she develops. Some growing foals take on the look of potential stakes winners, but unfortunately they did not achieve the level of expectations they evoked in their owner. Conversely, there are some growing foals whose appearance do not give their breeder much hope for the future, but later become an exceptional race horse and/or exceptional progenitors in their adult life. A prime example of the latter type of foal is found in the story of the great race horse and sire Cyllene. Bred in 1895 by Charles Day Rose, Cyllene was a chestnut son of Bona Vista – Arcadia by Isonomy. Bona Vista was a son of Derby winner Bend Or, who has become one of the legendary names in the stud book. Bona Vista won the 1892 running of the 2000 Guineas for Rose, but was considered a dud at stud, and was sold in time for the 1987 breeding season to Kisber Stud in Hungary, before Cyllene stepped onto a race course. Arcadia meanwhile came from a good, but not great family. She descended in direct female line from Maid of Masham (fourth dam), who won twenty-two of her thirty-six starts including the Great Yorkshire Stakes, Newcastle Gold Cup and Cumberland Stakes. However the line had not produced anything of top class until Cyllene came along. Later generations in descent of Maid of Masham would include the exceptional sires Star Shoot and Fair Play. Cyllene was a small late foal, born on May 28. His chestnut coat was adorned with a white stripe down his face and two white socks. He was cleverly named after Mount Cyllene in Arcadia province in Greece, the birthplace of Hermes emissary of the Greek gods. Cyllene was also somewhat backward in early development so Charles Day Rose decided to not nominate the colt for the classics. When Cyllene emerged as a legitimate racing leader during his juvenile campaign Rose would come to regret that hasty decision. The first race for Cyllene came very early in 1887 at Aintree. March 26 of that year on Grand National Day in fact was when Cyllene made his first start. He had trained very well leading up to the race and duly won The Sefton Park Plate by three lengths as the odds on favourite. This was a full two months before his actual second birthday! Cyllene followed this with victory in the Worth Stakes at Gatwick carrying 129 lbs, conceding 9 lbs to each of his rivals. For his third race, the Triennial Stakes at Royal Ascot, Cyllene again carried 129 lbs to victory this time over a crack filly named Nun Nicer, who would in the following year win the 1000 Guineas. Cyllene made it four in a row in his next start, the lucrative National Breeders Produce Stakes at Sandown. Carrying 130 lbs, Cyllene defeated Ebba, who carried 123 lbs, by a head. Clearly a new star was on the rise. With his scintillating performances giving him much deserved adulation, Cyllene was also being penalized for being so superior. He was assigned 136 lbs for his next outing, the Imperial Produce Stakes. This race carried much weight in voting for championship honours, and took place in October at Kempton Park. However the little colt carrying the big weight lost by ¾ of a length to the good big colt Dieudonne, who carried 10 less lbs. The race did not diminish the admiration toward Cyllene and he was named as the top juvenile of 1887. Due to his unavailability for the classics, Cyllene’s three year old season offered him limited chances to prove himself against the best of his generation. He got off to a slow start when he finished a disappointing third in the Column Produce Stakes at Newmarket. Cyllene was sent off as the overwhelming favourite but could not overcome his impost in the one mile race, giving 21 lbs to the winner and 13 lbs to the runner up in the early April tilt. The following month he redeemed himself with a dominating four lengths victory in the 10 furlong Newmarket Stakes. Notable in this win was his record setting time for the distance and that he handily defeated Jeddah, who would later win The Derby in that one’s next start. Cyllene was given an extended rest of four months after this performance, returning to Newmarket for his entry in the valuable Jockey Club Stakes. The September race drew a very strong field for the 10 furlong tilt, attracting the entries of Chelandry (who had earlier won the 1000 Guineas), Airs and Graces (Epsom Oaks winner), as well as the classy four year old Velasquez (who had won the Eclipse Stakes and would in his next race capture the Champion Stakes), as well as old foe Dieudonne. Cyllene dominated this strong field when he flashed by the winning post six lengths clear of Valesquez, with Chelandry third. As a side note to this race, Velasquez was a half brother to Cyllene’s sire Bona Vista, while classic winner Chelandry would later become one of the all time great broodmares in the stud book. Cyllene made one more start in his three year old season, a handy four length victory over Pie Powder in the 10 furlong Sandown Foal Stakes. He was giving that rival 17 lbs. Thus Cyllene’s three year old season, a season in which he was ineligible to compete in the classics, proved him to be the best at 10 lbs with three victories at the distance against top class opposition. Many considered him as the best of the entire three year old crop in 1898. He would return for another racing year, although it would turn out to be an abbreviated one. The one knock against Cyllene was that he never raced beyond 10 furlongs. Now you have to remember that in this era of Thoroughbred Racing, distance ability as well as speed was equally vital on a horse’s résumé when retired to stud. Charles Day Rose and his stable’s trainer William Jarvis set out to prove Cyllene could carry his obvious speed to a much longer distance than the colt had raced before. They chose the 20 furlong Ascot Gold Cup, the most important distance race on the English racing calendar as the target for Cyllene to prove his stamina. Jarvis used as the prep race for Cyllene the 16 furlong (2 miles) Triennial Stakes, a different stake event than the two year old race of the same name, run on the first day of the Royal Ascot meet. Cyllene easily won the race by two lengths. Next came the big test, which would take place a mere two days later at the same meet. The Ascot Gold has been the most important long distance race in the world. Its great history and prestige goes beyond British borders. The traditions of the race, which is enhanced with Royal patronage, keeps this race as one of the turf world’s premier events. 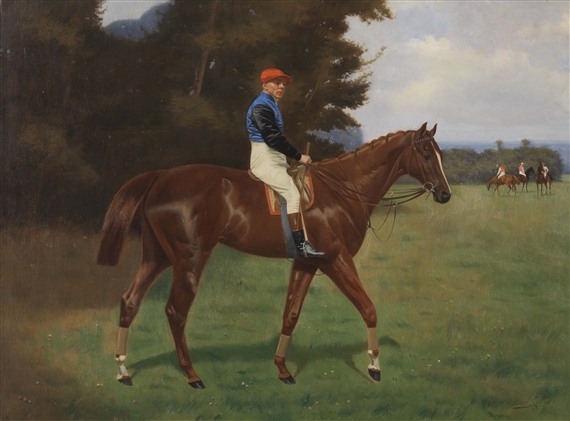 In 1899 the Ascot Gold Cup had already attained this lofty standing when Cyllene lined up for the start of the race. He would face a powerful field of hardened stayers led by French invader Gardefeu. Gardefeu had won three high class distance races which included a resounding win in the Prix du Jockey-Club and was considered as the best stayer in French racing at the time. Cyllene put in his most impressive race of his career at Ascot in this running of the Gold Cup. The little chestnut son of Bona Vista won the great race by a commanding eight lengths. Observers of the race used terms like “toyed with the field” and “simply played with his rivals”, when describing the brilliant performance Cyllene exhibited on the day. His jockey Sam Loates was petting him and tipping his cap to the crowd as he and Cyllene passed the finish post in victory. Cyllene had proven beyond all doubt that he could carry his world class speed to great distance in winning the two and one half miles long Ascot Gold Cup. It was his greatest achievement on a race course. However, that would be the final race of Cyllene’s brilliant career. Charles Day Rose retired his prized steed to stand at his Hardwick Stud, Berkshire. Rose placed a stud fee of 150 guineas for Cyllene’s services, but there was no rush from breeders in patronage. Despite his wonderful race record of nine wins from eleven starts, and never being off the board in any of his races, Cyllene was viewed by many breeders as to be an unworthy stallion for their top mares. His pedigree came into question by the nay saying breeders of the time. 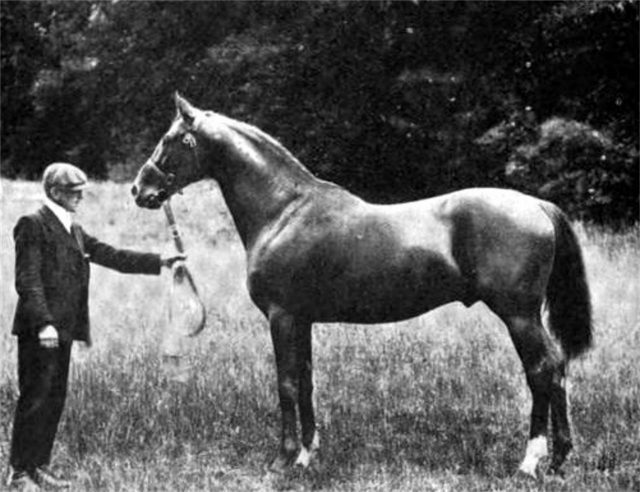 These “Doubting Thomases” pointed to his female family’s lack of producing a quality stallion within the previous four generations, and also that his sire Bona Vista had only produced one horse of any kind of class, although that one was Cyllene himself, and that he had been sold to Hungary in exile. Well if they only could have access to a crystal ball. Cyllene had to prove himself again in his new career, as he had to when he was considered to be unworthy of classic consideration as a race horse when he was a foal. Despite receiving few quality mares in his first couple of seasons at stud, Cyllene quickly reversed the opinions of the breeding world. He spent nine years at stud in England, five at Hardwick. Day sold Cyllene to William Bass for 30,000 guineas which transferred the stallion to Egerton Park in Newmarket. Bass in turn then sold Cyllene to Ojo de Agua Stud in Argentina for 25,000 Guineas three years later. In his nine years of stud service in England, Cyllene sired four Derby winners, Cicero (1905), Minoru (1909), Lemberg (1910), and the filly Taglie (1912) who also won the 1000 Guineas. Minoru’s Derby victory for King Edward VII was special in that he is still to this day the only Derby winner to carry a reigning monarch’s colours to victory in the great race. This came on the heels of his 2000 guineas win. The Derby wins by Minoru and Lemberg carried Cyllene to two leading sire titles in Britain. But by the time of these sire championships Cyllene was residing in Argentina. In Argentina, Cyllene founded a dynasty that included four classic winners, a leading sire title and many broodmares that became excellent stakes producers. An offer was made to Ojo du Agua Stud to return Cyllene back to English shores, but was turned down. He was never to return to his homeland, but all was not lost for the English/Irish breeding community because from his second crop came a son that would take the mantle from his sire and further the fortunes of the sire line to great heights. His name was Polymelus. Polymelus was not one of Cyllene’s best colts on the track, but he was quite good none the less. Bred by the Earl of Crewe, Polymelus was a bay colt out of Maid Marian by Hampton. He won eleven of thirty-one starts and placed in the money another nine times during his career. His major victories came in the Richmond Stakes and Rous Memorial at two, the Duke of York Stakes at three, Champion Stakes and Cambridgeshire Handicap at four, and the Princess of Wales Stakes at five. Polymelus was sold twice during his racing career and ended his racing as the property of Solly Joel. Being a cut below the best of his generation, Polymelus entered stud with mixed opinions. Polymelus proceeded to become a first class stallion, leading the English/Irish sire list five times and siring three winners of the Derby Stakes. Pommern not only won the Derby but also swept the war time Triple Crown in 1915. Humorist won the 1921 Derby and the great filly Fifinella won the Derby and the Oaks, the last filly to accomplish this phenomenal feat. Another classic winner sired by Polymelus was Cinna, winner of the 1000 Guineas in 1920. However, like his sire’s and his own racing/breeding career, his best son a stud was not a classic winner. When Polymelus met Lord Derby’s broodmare Bromus by Sainfoin, a brown colt was the result. Given the name Phalaris the colt proved to be a consistent source of speed in Thoroughbred breeding and became the foundation sire of the 20th century. From here comes a litany of champions on the track and in the breeding shed with names such as Fairway, Nearco, Nasrullah, Northern Dancer, Bold Ruler, Buckpasser, Native Dancer, Nijinsky, Mill Reef, Sadler’s Wells, Danzig, Mr. Prospector, Seattle Slew and many more of the elite stallions in many generations. The classic winners sired by Cyllene were an indifferent lot at stud. Minoru has a place in history however as the sire of Lord Derby’s mare Serenissima out of Gondolette. Serenissima became the dam of the immortal Selene, dam of Pharamond II, Sickle, Hurry On and the great Hyperion. She is also the fourth dam of the ground breaking stallion Sir Tristram. The daughters of Cyllene should not be ignored. Bellavista produced 1922 Derby Stakes winner Captain Cuttle, who in turn sired classic winners Scuttle (1000 Guineas) and Pilade (Derby Italiano). Maid of the Mist was out of the great race mare Sceptre, produced two classic winners in Sunny Jane (Oaks) and Craig an Eran (2000 Guineas). Her stakes winning daughter Hamoaze produced multiple stakes winner Buchan and Coronation Cup winner St. Germans. Both of these sons became successful sires. More successful daughters of Cyllene include, Mistrella, dam of 1927 Oaks winner Beam, and Belle Vue is the dam of Prix de Diane (French Oaks) winner Doniazade. When summing up the life of Cyllene we are hit square on the head with his brilliance and accomplishments despite critical prognostications forecasted of his successes. He was a classy and versatile race horse, an influential and pivotal stallion in history, in spite of always being undermined at every turn of his life. Although he was ineligible to compete in the Derby Stakes, Cyllene had a profound influence on the race. He is one of five stallions to sire four winners of the great race in the two hundred and thirty-nine year history of the Derby. The others are Sir Peter Teazle, Waxy, Blandford and Montjeu. No stallion has sired five. Cyllene was a grandson of the great Bend Or. His grandson Phalaris was the important sire in the early 20th century. In turn Phalaris’ grandson Nearco became the key stallion to the future of the breed. Nearco’s grandson Northern Dancer became the foundation stallion to today’s elite sire lines, led by his grandson Galileo. See a pattern here? Cyllene is so far back in pedigrees today that to most followers of Thoroughbred breeding he is but a footnote. I will bet you the farm that he is in the pedigree of every foal born today. We should give him his due credit for his contribution to the breed. There are many such legends of great Thoroughbreds in turf history that have overcome preconceived notions toward potential, but the story of Cyllene is to be cherished. His own sixth generation tail male descendant Northern Dancer was just such an example, and we all admire him for his achievements. We should do the same for Cyllene. As stated earlier, Cyllene never came back from Argentina. He died at the age of thirty in 1925, due to his advanced age. He lived a long a very fruitful life. He is one of the great names in the stud book and his legacy of brilliance and class has been passed down from generation to generation with regularity. Not bad for a runt foal dismissed as inferior by his breeder. Great story! He was a little giant just like Northern Dancer. I really enjoyed reading this article. Great stuff. Thanks for the history leason.